The ASUS ZenFone Max M2 (review) arrived late last year with an attractive price tag of Rs 9,999. This phone, as you know, is an affordable variant of the ZenFone Max Pro M2 (review) — the successor to the ASUS ZenFone Max Pro M1 (review) that was also released last year in April at a cost of Rs 10,999. But the Taiwanese brand has now announced a price cut for the Max Pro M1, making its price the same as the Max M2. This makes for quite an interesting comparison given the difference in the specifications of both these phones. If you’re torn between which one among them to go for, here’s a detailed comparison between the two. Simple aluminium shells have been granted to both these phones, and the arrangements of their rear cameras as well as their fingerprint readers also remain the same. The front is where things have changed for the new phone. The ZenFone Max M2 has decided to go for a notched display that has curved corners and minimal bezels. On the other hand, the Max Pro M1 features an 18:9 display. While the phone has thin bezels on the sides, they’re quite noticeable on the top and bottom. One of the things that make the M1 a better device than the M2 is the display resolution. The 5.99-inch screen sitting on the front of the ZenFone Max Pro M1 bears a resolution of 1,080 x 2,160 pixels, while the 6.26-inch display of the M2 only offers a resolution of 720 x 1,520 pixels. Both these phones come with IPS LCD panels. Speaking about other design choices, they both have their headphone jacks intact, and they also ship with loud 5-magnet speakers. These two are dual-SIM phones with triple slots onboard, which allow you to use two SIM cards as well as a microSD card at any given time. At the core of both these handsets rest Qualcomm’s chipsets with 1.8GHz octa-core processors. The ZenFone Max M2 gets the Snapdragon 632 chip with an Adreno 506 GPU, while the ZenFone Max Pro M1 sports the slightly better 636 SoC with an Adreno 509 GPU. When it comes to memory, the M2 offers two RAM and storage options of 3GB + 32GB and 4GB + 64GB model. As for the M1, it comes in the form of a 3GB + 32GB variant, a 4GB + 64GB version and a high-end 6GB + 64GB option. When the ZenFone Max Pro M1 was launched back in 2018, it became ASUS’ first phone to ship with near-stock Android software. This change in approach helped the company deliver a smooth software experience, devoid of much bloatware, that was well appreciated by fans. The ZenFone Max M2 also adopts the same Android 8.1 Oreo software. A few things like the camera app are from ASUS however. This allows the company to employ its various AI-based photography features like scene detection, beautification and more. Face recognition is also something that’s common for the software of both these phones. ASUS has blessed the ZenFone Max M2 with a 13MP main camera and a 2MP depth sensor. The former features an f/1.8 lens, which aids low-light photography. And of course, a portrait mode is also on offer. The front camera of this device is an 8MP unit that’s assisted by a softlight flash. As for the ZenFone Max Pro M1, its rear camera setup includes a 13MP main camera and a 5MP secondary one. And its 6GB RAM variant goes a step further by offering a 16MP main snapper and a 5MP ancillary one. A portrait mode is also present on this phone. Coming to the front camera of the M1, it’s an 8MP snapper for the affordable models and a 16MP camera for the 6GB RAM variant. 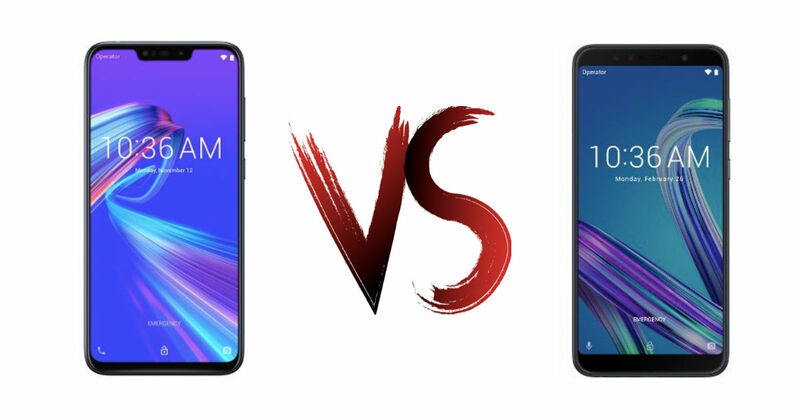 The main appeal of both these phones remains their two-day battery life. This is achieved by the Max M2 with its 4,000mAh power pack. The Max Pro M1 on the other hand, grabs a beefier 5,000mAh battery. The price cut introduced for the ZenFone Max Pro M1 seems like a strategic decision made perhaps to clear the old stocks. This indeed makes it a better phone when compared to the ZenFone Max M2. The ASUS ZenFone Max Pro M1 may not have a notched display, but it does feature higher resolution, a better chipset, a more powerful battery and enhanced cameras. And all this at the same price as that of the M2, makes the M1 a worthy buy.